I have been thinking about posting something about this for awhile now. I love the YouTube channel The Mom's View. I just can relate to these moms and I feel that I'm not alone in my trials with raising Michael. This past week they posted a show about how they deal with their children melting down in public. Does your parenting style change when you're out in the public? I'll admit that mine does. I'm a lot more aware of my surroundings and try to act as cool as I possibly can. A few weeks ago we were at Target and this mom had a daughter that was a lot older than Michael throwing a fit. I felt sorry for the mom, but I also felt sorry for the daughter. The mom was yelling at her and, in my opinion, not handling it the best way. I would have just went and checked out and left, but this mom kept shopping and screaming at her daughter. There have been several times where Michael has acted up and I had to stop what I was doing and leave. Every time, I felt so embarrassed because my son was not behaving. I had a mom come up to me one time and tell me not to worry about it, that we've all been there. That made me feel better, but I still sometimes feel judged when I'm out in public and my son doesn't behave. That's one of the main reasons Michael and I stay at home so much during the week. It doesn't seem to be as bad when Jon is with me. If Michael acts up, Jon takes him to the bathroom and has a talk with him and maybe even gets a spanking if one is called for. If that doesn't work, one of us will take him to the car and sit with him there until the other is done with what we were doing. Since becoming a parent, my views about a lot of things have changed. Before kids screaming would drive me up the wall, but now I completely feel for the parent that's child is screaming bloody murder. Most of the time I feel like it's mine that's doing that and generally if we've been waiting for a very long time it is. What precautions do you all take when going out with your kids? I always have several cars in my purse for Michael to play with and we always have some Michael friendly games downloaded on our cell phones. 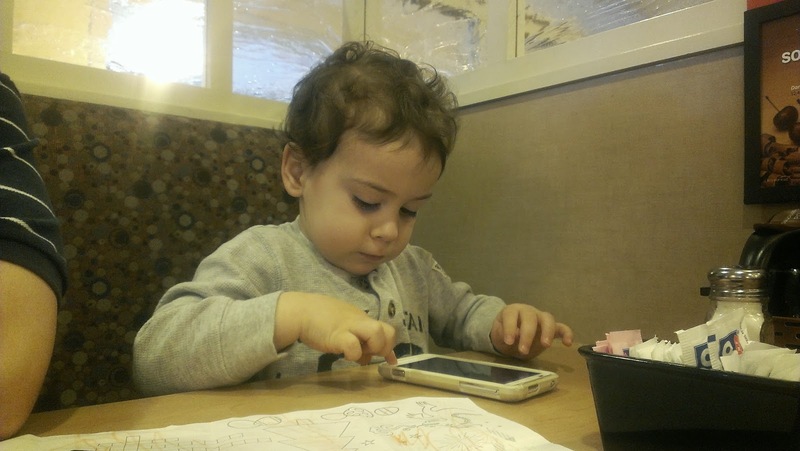 I never wanted to be one of those parents that put a phone or iPad in front of their kid to keep them quiet, but sometimes if you want to go out to eat in peace, it's what has to be done. The thing I hate is when he does act up, all the judgmental looks that you get from people. Even if they clearly can see we are doing everything in our power to stop the melt down. One time we were waiting to even be acknowledged to get a seat and Michael started screaming. The people behind us were like, "Oh, my God!" After that was said, we left. Don't need to be in a place that people are going to act like that when they could clearly see we were trying to get Michael under control and that we had been waiting for awhile. I have noticed a difference within the past month or so. I can go to the mall and actually have lunch with Michael. Well, as long as he has some cars to play with and my phone to play games on. Before he wouldn't even sit down - he would always be running off. We're slowly understanding each other. Let me hear what you all think and what has worked for you. Like they said in the video, every child is different and you just have to learn what works best for that child.